Blindcrake village is about 4 miles northeast of Cockermouth just off the old roman road to Carlisle (A595) and near the River Derwent. The village is in an elevated position (450 ft or 150m) above the Derwent Valley on the site of an early settlement. A unique mediaeval strip field system is in evidence in the northwest sector of the village. Its name is an anglicised derivation of the old celtic Blaen-craig (Blencraic in the middle ages), meaning at the summit (blaen) of a rocky outcrop (craig), referring to the nearby Clints Crags. With a population of some 287 (2001 census), its 69 houses are spread on either side of the main street through the village and date from the 1700s. Four working farms are currently functioning within the village. There is a village green and a smaller green containing a well (Grade II-listed). 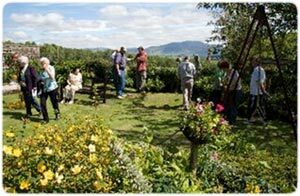 The village features regularly in the annual Cumbria in Bloom awards and also holds its own open garden festival - the Garden Safari - every July. 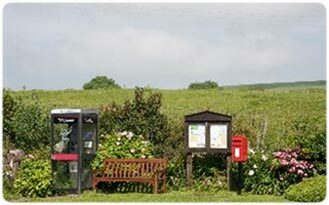 Blindcrake Village has been designated a Conservation Area by the Lake District National Park Authority in recognition of its special historical, archaeological and architectural merits. Its history was commemorated in a book, now out of print - A History and Survey of Blindcrake, Isel and Redmain (H.E. Winter, 2nd ed., 1988) and a survey of the Parish was also published privately for the millennium. 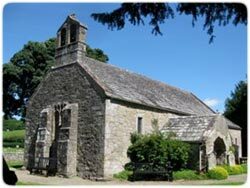 The 11th Century parish church, St Michael and All Angels, that serves the community is located in Isel, about a mile south-east of Blindcrake on the banks of the Derwent. It holds a harvest festival. Isel School that served the community from 1674 (now a private home) is located halfway between the two villages. The main village pub, the Ghyll Yeat Inn, was formerly the toll house to the Isel Estate but closed as a pub in 2000 and is now a private home, part of which is let as a self-catering cottage. Isel Hall is the centre of the Isel Estate and stands on a steep slope above the River Derwent, with its south facing terraces overlooking the river. The oldest part is the Border pele tower, a fortified structure built around 1400 on the site of a much older structure probably destroyed when the Scots raided Cockermouth in 1387. The house was lived in by the Leigh family from the early 1300s to 1573 when the house passed to the Lawsons who lived there until 1986. It was the private home of Miss Mary Burkett OBE, until her death in 2014. She was formerly the Director of the Abbot Hall Art Gallery in Kendal. The house is open to the public for guided tours on Monday afternoons from the last Monday in March to the first Monday in October. Miss Burkett had compiled a memoir of a former parlourmaid at Isel Hall, Miss May Moore (I Was Only A Maid - the life of a remarkable woman, Firpress Ltd., Workington), who also featured in a Border TV documentary filmed at the Hall in 1997. May Moore was in service to Sir Wilfred and Lady Lawson in the 1920s, from the age of 13. As well as cleaning and other duties, she was persuaded to drive the family Daimler to Carlisle to collect provisions when she was 14 years old. May was later head housemaid in Coniston, regularly cycling the 39 miles across the Lake District to visit her mother in Blindcrake. Whilst at Coniston she was befriended by Beatrix Potter (Mrs. Heelis), cutting her hair, sewing clothes and cleaning at Hilltop. May finally returned to Skiddaw View, Blindcrake, to help her sister in looking after her mother and spent the rest of the 17 years of her working life as a machinist at a local clothing factory. After retirement she helped out at Isel Hall as a guide - recounting at first hand, with a remarkable facility to relive past events, the way of life in the early part of the last century. The village hosted a 90th birthday party for her in the village hall in 1997. May Moore died in 2003 at the age of 96. Miss Burkett died on 14th November 2014 shortly after her 90th birthday, which was also marked by parties at Isel Hall and in the village hall. Blindcrake has 6 grade-II listed dwellings, mostly built in the early 18th century. 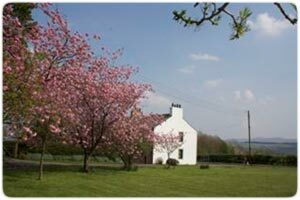 In 1750 the Isel estate built a row of cottages in Blindcrake. The two end cottages were used in the 1800s for bacon curing (downstairs) and a primitive Methodist meeting room (upstairs). In 1894 the Methodist group bought the building and made it into a chapel; it is now a private home. The village hall is housed in the remainder of this row. Allison House, a large farmhouse originally built in 1724, is named after the Allison family who were prominent in the area. Blindcrake Hall, in the middle of the village, is another large house that dates from the same period (1728). Thorneycroft is reputedly the oldest (1613) house in the village. Grey heron, mallard, sparrowhawk, buzzard, grey partridge, kestrel, oystercatcher, and lapwing are among the birds seen in the area and a pair of nesting osprey are regular visitors to nearby Bassenthwaite Lake. There are a large variety of butterflies in the countryside around the village. Clints Crags limestone pavement (800ft; 247m), an area of special scientific interest, is located about a mile from the village on a public walking path. Its ascent is included in one of Alfred Wainwright's books, The Outlying Fells of Lakeland, which he dedicated to "the old-timers on the fells" (Frances Lincoln Press Ltd., 2007). The Allerdale Ramble walking route also traverses the parish from west to east following the north bank of the Derwent down towards Bassenthwaite Lake. The parish lies within the Lake District National Park and Blindcrake is a designated conservation area (since 2001) of the National Park Planning Authority, largely on the basis of its mediaeval field strip pattern which is the last remaining example within the National Park. The Lake District National Park Conservation Plan, which contains much detailed information about the village, can be downloaded from the Council>Publications webpage in the menu bar above.